Mickey Rourke has won an exhibition boxing match in Moscow after returning to the ring for the first time in 20 years at the age of 62. 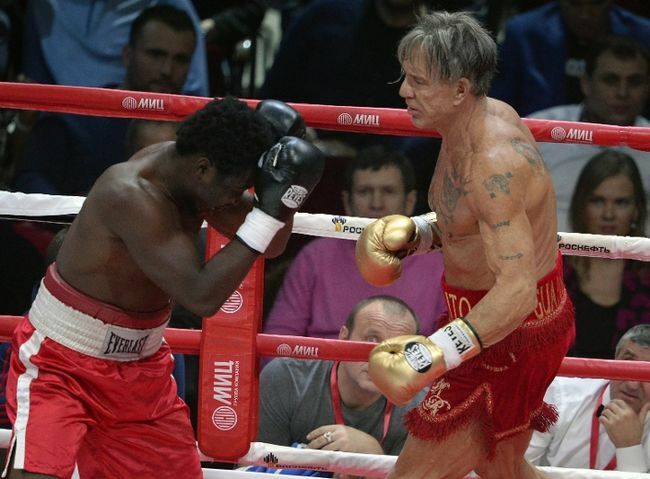 Mickey Rourke defeated Elliot Seymour – a former California Golden Gloves champion 33 years his junior. The former Hollywood star sent 29-year-old Elliot Seymour to the canvas twice in the second round before the referee stopped the fight. Mickey Rourke was an amateur boxer before finding fame in Hollywood movies such as 9 1/2 Weeks. The organizers of the match said the boxers were receiving “large amounts of money” in fees but declined to give details. “I’m very happy to be back to the boxing ring. Thank God for letting me do this,” Mickey Rourke said ahead of his fight with Elliot Seymour. The actor refused to go into detail about his motivations for returning to the ring, but told Russian TV boxing had “sort of saved me from myself”. Mickey Rourke is reported to have lost more than 33lbs for the fight, weighing in at 179.2lbs, the same as his rival. Elliot Seymour is ranked 256th in the US and before the fight with Mickey Rourke had one knockout and nine losses in 10 bouts. Mickey Rourke returned to boxing as a professional in the 1990s and was undefeated in eight fights, with six wins and two draws. However, he suffered a number of facial injuries, which required surgery and changed his appearance. In 2008, Mickey Rourke won a BAFTA and Golden Globe for his role in the film The Wrestler, which told the tale of a former wrestling professional who decided to return to the sport.